Who are our dream people? Where do they go when they go into hiding? When I was growing up I sang all the time. At the sink, in the yard, in the car, on the footpaths (sidewalks as we called them). It was all I could do to keep myself from singing out loud in class. My mother was an actor but she had such a difficult time of it that I was never moved to step into her shoes. But singing! I had no desire, what’s more, to play a musical instrument. My voicebox was my instrument, and I was not a little proud of it. I couldn’t read a note but I had perfect pitch. My key was E flat, but I still don’t know quite what that means. My musical education began with Hoagy Carmichael’s “Stardust”. I heard it first when I was three years old. It amazes me that every afternoon I was put out on the landing of our Chicago apartment fire escape for what was supposed to my nap, and shudder to think what I could have got up to, and then go on to wonder what benevolent power it was that kept me from falling to my death. For nothing could succeed in making me fall asleep as I was meant to. With a stack of crates full of empty green glass coke bottles by my side, and music pouring forth from the radios in all the open windows around me, my senses were charged. One by one I pulled out the coke bottles from the crates, upended each over my outstretched tongue and, like the Magic Pudding of Norman Lindsay lore, the drops in the bottom always seemed to replenish themselves, quenching my thirst, just as “Stardust” never failed to answer some longing in my heart. I could hardly understand the lyrics then, but Carmichael’s poignant melody is with me to this day. A couple of weeks ago I went to a concert organised for Sydney’s senior high school jazz bands. My grandson Tom was playing the alto sax in one of them, and since I hadn’t done my grandmotherly thing for a while, I went along, but with low expectations. What happened when I got there warmed me tremendously. Not only did it expose me to the excellent talent being nurtured among our young, and all the good work their teachers have done, but it catapulted me back into a long lost past. The reason was the songs. The three bands I heard varied from passable to outstanding, but what shook me were the songs. Each band had a singer or singers, and though they didn’t sing “Stardust” the ones they did came from the same era. The solos from the first singer were Jerome Kern’s “All the Things You Are” and Gordon and Warren’s “At Last” - two songs I hadn’t heard for maybe half a century. From nervousness I thought, the singer had some trouble with the first song, with its tricky if lovely key change and sudden high notes, but after regaining her confidence she acquitted herself well with the second. The extraordinary thing was my remembering the lyrics to these pieces. And those to the next ones sung as well - Gershwin’s “How Long Has This Been Going On?” and, appropriately enough, the quirky “I Could Write a Book” from Rodgers and Hart. Where inside me had these gorgeous words come from? Where had they been all this time? I gave up singing over fifty years ago, before I came to Australia, when I got married and couldn’t afford the fees. Remember, this was the fifties, when few of us thoroughly wedded women allowed our own private dreams to materialise. Until that fateful union I was driving every Thursday afternoon to the formidable Mrs Goodman’s, up in the Hollywood Hills. Coach to the stars, Goodman was an impressively bulky woman, with soft light brown hair piled up on her head. She sat at the grand piano, her beringed fingers sailing through the octaves, coaxing my voice ever higher. While outside the sprinklers clicked and whirred, spraying the french windows and occasionally her lawn, my vocal cords stretched to the utmost around Alone, alone, on the wide, wide sea/Alone, alone on the wide, wide sea, hoisting my voice upward through the keys. She said I had genius but not enough strength in my lungs and singing Coleridge was designed to give me power. I was about to cut my first record when I gave it away and plunged into wedlock and motherhood instead. The truth was I lost heart. My favourite singer was Ella Fitzgerald, but Mrs Goodman was modelling me on Teresa Brewer. Teresa Brewer? you say. Well, Brewer was a popular singer in her day, probably underrated, but she wasn’t Ella, and the disappointment I felt played no small part in my decision, a decision that landed me in Australia and another life altogether. Some of my friends are closet singers but I’m not going to out them here. Two I know are good at remembering lyrics as well. We were the women of the 60s and 70s, and many of us threw off those marital shackles. One became a cabinet minister, three ended up as professors, two in history, the other in media. That last one joined a choir, and now and then I’ve thought about joining one myself, but where, I tell myself, would I ever find the time? Instead, I think about Ella. In the days when I went to see her at the Hollywood Bowl or in places like the Crescendo on Sunset, I hadn’t the slightest doubt that she was the happiest person in the world. Because she could sing like she did, and no one else could. When people asked who I would change places with if I couldn’t be me, I had no problem with the answer. 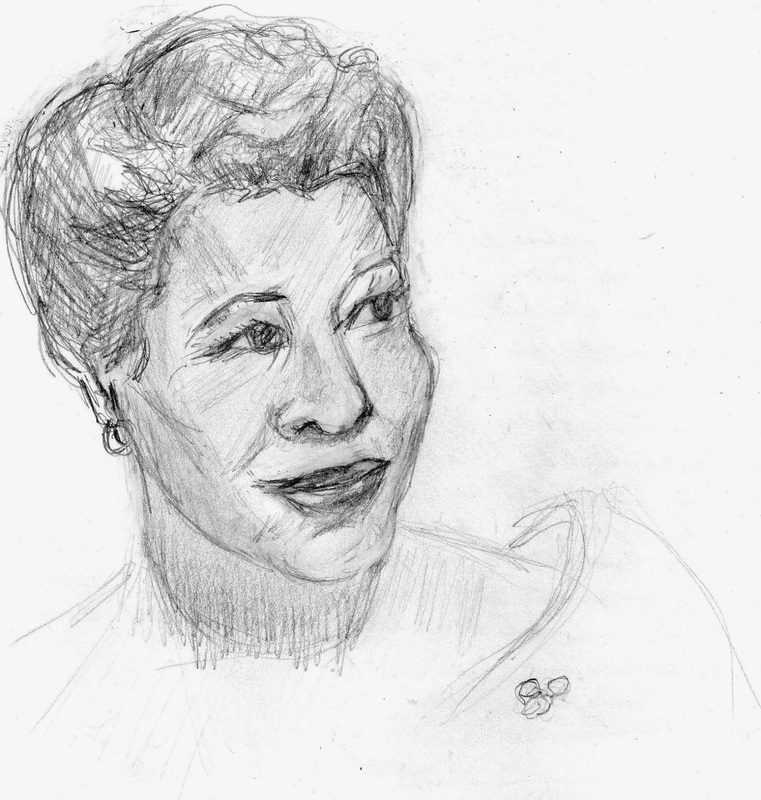 Ella Fitzgerald, I would say. Except to Mrs Goodman. Then I heard a sweet-sad story. A friend of my husband’s was working in a club one night, waiting on tables, washing the dishes - that sort of thing. It was in the wee small hours, the place was closing, he was clearing away the glasses and ashtrays, and who should come in but Ella. She had broken up with her man and she was crying. She sat down at the piano and told him about it. Him and him alone. She played as she cried and spoke to him, and then she started to sing. All through the night she sang her heart out to him, for that is what singing is for. After my grandson’s concert had ended, I saw my ex-husband, the guy who brought me to Australia all those years ago, the one with whom I share my grandchildren. When I told him how excited I was to hear those old songs, he confessed he was disappointed. ‘That woman who sang the Gershwin - she murdered it.’ ‘She was a professional,’ I said. (All the bands had one professional musician play with them, the best in their fields.) He shook his head. ‘She isn’t Ella.’ I thought he was being unfair, but he was right. There was only the one, and will never be another.